The corporate image factory spends a huge amount of money on billboards, posters, flyers or ‘guerrilla’ marketing campaigns masquerading as street art. They fill your lives with an unrelenting barrage of preposterous ideals, numb values and false icons. No one asks for your permission before they push these images in your face so neither should we seek consent in order to leave our own mark on the city. 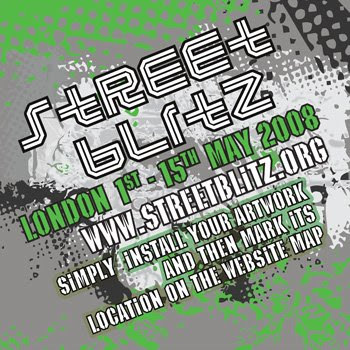 Street Blitz propose a 2 week blitz of street art in London between 1-15 May 2008. Whether you make murals, stencils, stickers, posters, sculptures, street projections, sign modification/removal/additions, billboard subverting/defacing/destruction etc; whether creative or destructive; whether to convey a message, brighten up a dull spot, rewire some corporate brainwashing tactics; whether to leave your mark, remove a stain, express yourself or simply to show your disgust – it’s all valid and all adds to The Blitz! Use London as an open gallery, and there will be a map of the city primed and ready for Blitzers to post their activities, no matter how big or small, onto a map overlay. Install your art or anything which changes the perspective on our city then get online and post it onto the empty map on the Street Blitz website. What happens if some cops come and arrest me?